In our previous post, we demonstrated how to setup the necessary software components, so that we can develop and deploy Spark applications with Scala, Eclipse, and sbt. We also included the example of a simple application. 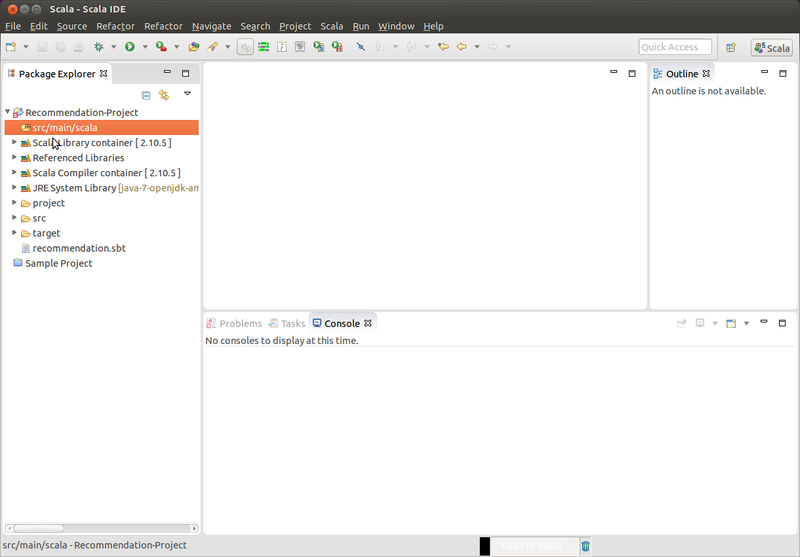 This time we will create an empty project and use Eclipse IDE to manage it. libraryDependencies += "org.apache.spark" %% "spark-core" % "1.4.1" % "provided"
Notice the keyword provided at the end of the library dependencies line. We will come to this later. Now add a new Scala object. * An example app for ALS on MovieLens data (http://grouplens.org/datasets/movielens/). * A synthetic dataset in MovieLens format can be found at `data/mllib/sample_movielens_data.txt`. * If you use it as a template to create your own app, please use `spark-submit` to submit your app. * So we should not recommend a movie if the predicted rating is less than 3. * entries are generally between It's okay and Fairly bad. * are "the same as never having interacted at all". * 0 means "don't know" and positive values mean "confident that the prediction should be 1". * Negative values means "confident that the prediction should be 0". * depending on whether r is positive or negative. * Abstract class for parameter case classes. * This overrides the [[toString]] method to print all case class fields by name and value. * @tparam T  Concrete parameter class. The above code defines a Scala object MovieLensALS, containing the main entry of the application, and a helper class AbstractParams that finds all case class fields in a concrete class instance and outputs them in JSON-style format. Normally, this helper class would be located in its own source file; for this example, we merged the definitions of MovieLensALS and AbstractParams into one single file. From the figure above we can see two libraries missing: (a) spark/mllib and (b) scopt for command line argument parsing. The first one is an essential part of all Spark distributions, while the second one is an external dependency. There are many ways to overcome the problems of missing dependencies (jars) in Eclipse IDE; in this post, we will use the sbt tool to create them, since it is also used for code packaging. This way we accomplish a uniform development/deployment environment. libraryDependencies += "org.apache.spark" %% "spark-mllib" % "1.4.1" % "provided"
libraryDependencies += "com.github.scopt" %% "scopt" % "3.3.0"
The keyword provided after spark-code and spark-mllib definitions excludes them from being bundled, since they are provided by the cluster manager at runtime. On the other hand, we don’t expect our target machine to include the scopt library, so we omit the provided keyword for this entry. Notice that provided keyword is parsed by the sbt-assembly plugin and used only in the creation of the final deployment jar. Connecting to files.grouplens.org (files.grouplens.org)|128.101.34.146|:80... connected. Got 1000209 ratings from 6040 users on 3706 movies. rank and lambda are arguments that need to be provided to our program, which outputs a root mean squared error (RMSE) for the test set. Explanation of the detailed meanings of these parameters are beyond the scope of the present post. In this post, we have demonstrated steps 1-3 above, this time with a realistic application involving moving recommendations, which required packaging also extra Spark and Scala libraries with our project. It is crucial that you set the directory structure correctly. Can you confirm that, so that I can start digging the issue deeper? Yes, this is the structure. The previous tut works fine. 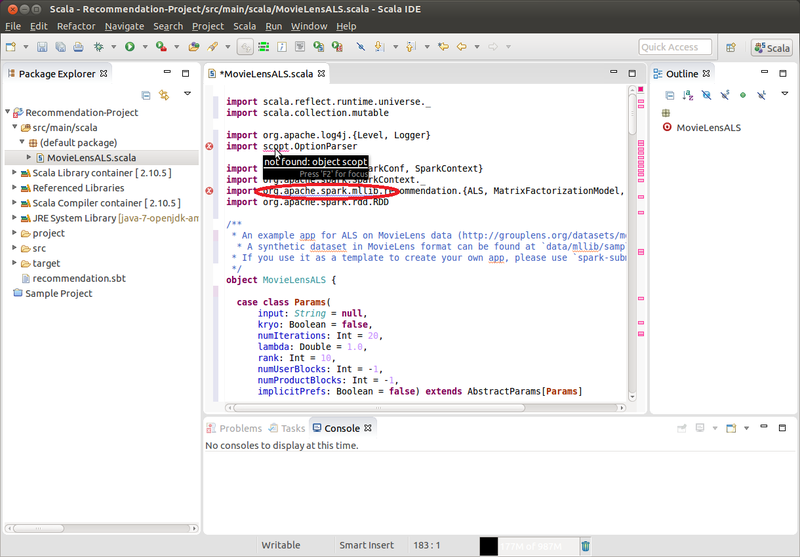 It seems so that Spark 1.5.0 is build with Scala 2.10. 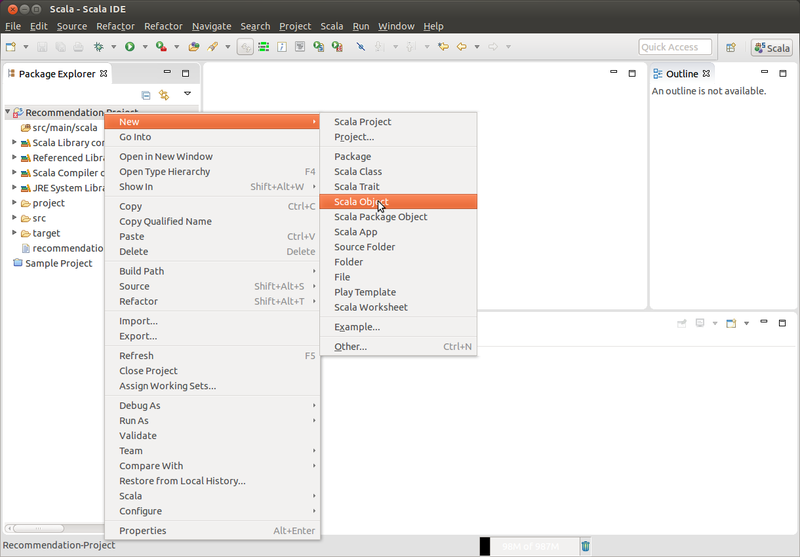 I chaged the recommendation.sbt the scalaVersion to 2.10.4 and everything works fine, strange. 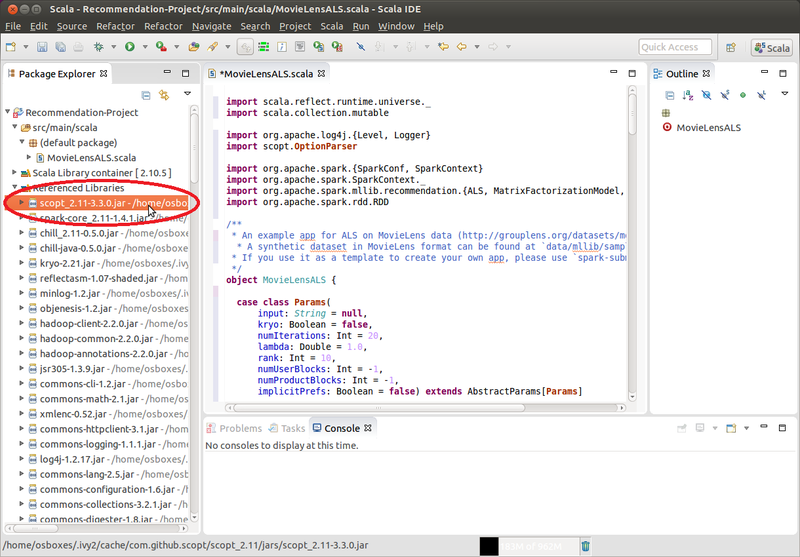 Did you use a Spark version build with Scala 2.11 ? Great! I am happy you have resolved your issue! many precompiled versions still use Scala 2.10. Indeed, before Spark 2.0, all pre-built binaries were built with Scala 2.10. Thankyou for the great post. This allowed me to break shackles on how to execute a spark application. Can you assist me in deploying this application in a Two Node HDFS cluster running YARN. Any help is greatly appreciated.